NEVER to leave them up overnight, particularly with the roof and side panels on. Other 10x10 Pop Up Tents 10x15 Pop Up Tents 10x20 Pop Up Tents Party (Wedding) Tents PVC Tents Carports Greenhouse Hammocks Camping Tents Pop Up Tents Canopies Garden Canopies Custom Canopies Canopy Accessories. Stable Roof & 10 Removable Sidewalls & 2 Zippered Door! Transform your garden with our PE party tent and bring a sense of cheerful atmosphere into your party. Note : ITEM NEEDS TO BE ANCHORED TO GROUND TO HOLD AGAINST WIND. NEVER to leave them up overnight, particularly with the roof and side panels on. Order is for selected items only. 1X Canopy Tent. • Cloth: PE, roof 180g/m2, 2x2m sidepanels 180g/m2. Water Resistance it does not waterproof. it will leaking during raining. • Heat bonded PE cover, Water Resistant. • Corner ropes and pegs included. Full sides tent. Type: Full sides tent. 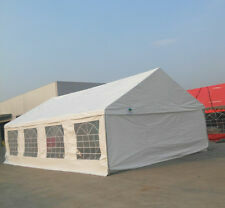 Product: Party Tent. Tent Height: 3.05m. Heat boned PE cover and water-resistant. Luxury heavy duty 180g PE top UV. Hold Approx. 100 people. 4 storage bags included ($80 value) for easy storage!!! SIZE: 3m 9m 6 x Walls w/Windows / 2 x Solid Walls. Removable Walls attached with Velcro Fasteners. Easy Removal and Assembly. Polyester Fabric is not fire proof, pls keep away from fire sources. Color: White. SIZE: 3m 9m 6 x Walls w/Windows / 2 x Solid Walls. Removable Walls attached with Velcro Fasteners. Easy Removal and Assembly. Outdoor structures must be securely fixed Polyester Fabric is not fire proof, pls keep away from fire sources. Size 20x40 ft. Wood/plastic tension block included for tightening tent ropes. Type Pole Tent. Guy ropes and jump ropes are spliced in at each pole location. 14 oz translucent vinyl (brighter in dark) top provides more light. 20' x 40' Party/Event/Wedding Tent, Carport or Canopy. TM ST2040WW Series is a top of the line heavy duty outdoor event tent, carport or. canopy and sidewalls, making this tent fabric waterproof. or without the sidewalls. Wedding Event Party Privacy Sidewall Kit For 20x40' High Peak Tent - Fire Retardant, Waterproof 14 Oz Vinyl. Note : This item does not include Tent. Sidewall Height 8 Foot. Sidewall Length 20, 30 Foot. Sidewalls are constructed using 11 oz. Also available without sidewalls,view here ! Includes Complete 20x20 Pole Tent, (2) Solid 7x20' Sides, (2) Cathedral Window 7x20' Walls, Storage bag, steel stakes, ropes, and set up instruction. Note : ITEM NEEDS TO BE ANCHORED TO GROUND TO HOLD AGAINST WIND. NEVER to leave them up overnight, particularly with the roof and side panels on. Other 10x10 Pop Up Tents 10x15 Pop Up Tents 10x20 Pop Up Tents Party (Wedding) Tents PVC Tents Carports Greenhouse Hammocks Camping Tents Pop Up Tents Canopies Garden Canopies Custom Canopies Canopy Accessories. 157cm Wooden Chicken Pigeon Coop Backyard Nest Box Hen House Rabbit Wood Hutch. This party tent will be ideal for any outdoor event, such as a show, wedding, party, BBQ, camping trip, festival and so on. Ship from NJ & CA ! Delivery in 1-3 Days US 48 States ! It looks gorgeous with its church windows and unique high peaked roof. 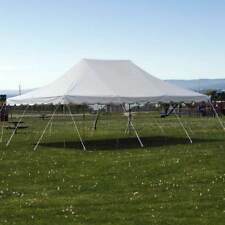 This tent is perfect for parties, weddings, picnics, flea markets, or any other special occasion. There are no columns holding it up from the inside so the floor is open and cleared. 1 x 10’x 30' Canopy Party Tent. Size: L30' x W10'; 8 sidewalls as picture shows(6 with window and 2 without window). Easy assembling, no need tools; Made of PE Material. 6 x Walls w/Windows / 2 x zip-up doorway. This is our best model - very hard wearing, with a thick heavy duty PVC canopy and PVC sides. The fabric is a much more luxurious material than the polyethylene used. The material is specially coated on the inside making it much more water resistant than the polyethylene. Tent Structure: Single Tent. - Suitable for: Household,Wedding,Party,Parking Shed. - Durable waterproof PE made. - Material: 90G/M2 PE & Steel. - Weight: 48.5 lbs / 22 kg. - Steel Pipe Thickness: 0.018" / 0.45mm,0.022" / 0.55mm. This 10'x20'Canopy Party Wedding Tent, we have done the product upgrade, pipe connection spiral tube, use more firmly. The exit of each windbreak has been improved, and these corners are not easily cracked. Tent, a commonly seen gadget in our daily life! If you are in need of a portable and practical tent, you can try this 3 x 6m Four Sides Waterproof Foldable Tent! It is particularly designed for party only. This party tent will be ideal for any outdoor event, such as a show, wedding, party, BBQ, camping trip, festival and so on. You can also install it in your backyard as a large sunshade for your family and guests. Garden marquees are tents that you can host an event in. They come in many sizes and styles to use for weddings, graduation parties, musical events, and more. eBay offers a wide variety of new and used garden marquees and tents for hosting everything from a casual garden party to a formal wedding. What styles of garden tents are available? Pole Tent: This party tent is supported by many poles and guy wires, creating an elegant silhouette. Frame Tent: This type of tent is supported by a metal frame and can be set up on many surfaces, making it more practical than the pole tent. Marquee Tent: This is a cross between a pole tent and a frame tent. It offers some of the elegance of the pole tent but has the practicality of the frame tent. Hex Marquee: This tent is named for the six legs that support the fabric canopy. What materials are garden tents made of? Polythyelene: This heavy-duty, plastic-coated ripstop material is UV-stabilized and fire-rated. PVC: This UV-stabilized, fire-rated plastic material has hook-and-loop sides. Ripstop PVC: This is PVC coated with a crosshatch weave that's waterproof. Canvas: Made of cotton or a cotton-polyester blend, this has a natural look but isn't waterproof. What features do marquees have? The types of features that a garden marquee can have depends on the style. Some have windows and glazing so guests at your party can see outside, and some even have doors that can be added when it's cold. Lighting options such as string lights and spotlights can be added to the framework and poles of a garden tent. Additionally, floating floors can be placed inside the garden tent. Can garden tents be used in any weather? Some marquee tents can be used in many types of temperatures and precipitation conditions. Many are waterproof, and some kinds can accommodate heaters to keep the inside of the garden tent warm. Canvas tents are sometimes used when the weather is warm and dry because although they aren't waterproof, they can be beautiful.